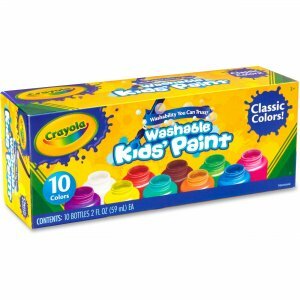 Washable Kid's Paint includes six colors of washable paint in six 2 oz. plastic jars. Washable paints are easy to apply with brushes, sponges, stamps, stencils, and other tools, and they can be used on almost any surface. Perfect for use with art easels, posters, school projects, signs and decorations. Paint is recommended for ages 4 and up. Colors include yellow, red, orange, blue, green and purple. Washable paint is specially formulated to easily wash from skin and most children's clothing.